For other people with the same name, see Sean Casey (disambiguation). Sean Thomas Casey (born July 2, 1974), nicknamed "The Mayor," is a former Major League Baseball first baseman for the Cleveland Indians, Cincinnati Reds, Pittsburgh Pirates, Detroit Tigers, and Boston Red Sox. Casey was selected to the Major League Baseball All-Star Game three times during his career. He is currently a broadcaster and commentator for the MLB Network. Casey attended Upper St. Clair High School in Pittsburgh, Pennsylvania, and graduated from the University of Richmond, where he was a member of the Sigma Phi Epsilon fraternity. His .461 batting average in 1995 led all Division I players. He was drafted in 1995 in the second round by the Cleveland Indians and was traded to the Cincinnati Reds before the 1998 season. On April 3, 1998, Casey was hit in the eye with a ball thrown by teammate Damian Jackson during batting practice, resulting in a fractured eye orbit, and subsequent surgery. Casey had his best year in 1999 hitting .332 with 25 home runs and 99 runs batted in (RBIs) and 103 runs scored in 151 games. In 1999, he won the Hutch Award. During his tenure in Cincinnati, and later in Pittsburgh and Detroit, Sean Casey was regarded as approachable and friendly, and his nickname, "the Mayor," comes from his reputation for chatting casually with every runner who makes it to first base, and from his very public charity work. It was frequently expanded to "the Mayor of Riverfront" when the Reds played at Riverfront Stadium. On May 16, 2007, Casey was voted in 2007 as "the friendliest player in baseball" by fellow players in a Sports Illustrated poll. He garnered 46% of the vote with the second place vote being split between Jim Thome and Mike Sweeney with only 7% each. Casey is also regarded as among the slowest-running players in the game, grounding into 27 double plays in the 2005 season. This tied him with A. J. Pierzynski for the record of most grounding in double plays by a National League left hander in a season. 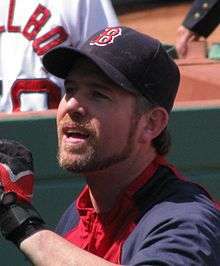 Sean Casey was signed to the Reds through the 2006 season. However, he was traded December 6, 2005, to his hometown Pittsburgh Pirates for left-handed pitcher Dave Williams. During an injury plagued 2006 season, Casey hit .296 with three home runs and 29 RBIs in 59 games for the Pirates. On July 31, 2006, Casey was traded to the Detroit Tigers for minor league pitcher Brian Rogers. During the 2006 American League Championship Series against the Oakland Athletics he partially tore his left calf muscle in Game 1. After coming back from his torn calf in Game 2 of the World Series, he became the hottest hitter for the Tigers, belting two home runs and batting .432 in five games. His .432 batting average was one of the best in Tigers postseason history. He has been active in Big Brothers and Make-A-Wish Foundation, as well as the "Casey's Crew" program, where he provided free high-priced tickets to disadvantaged youth. Casey credits his Christian upbringing in Pittsburgh's affluent Upper St. Clair suburb for his generosity. After being told by Dave Dombrowski and Jim Leyland that he would not be re-signed, Casey still praised Mike Ilitch, Dombrowski, and Jim Leyland for giving him the opportunity to come play for Detroit. Casey said "They let me know. I've had a great time with this team, the greatest year and a half of my career. It was great. But I understand the situation." On February 5, 2008, the Boston Red Sox announced they had signed Casey to a one-year deal. On April 9, 2008, Red Sox third baseman Mike Lowell injured his thumb and was then placed on the DL, first baseman Kevin Youkilis was moved to third, and Casey stepped in as the starting first baseman and exploded by making some good defensive plays and hitting .318 with five RBIs in his first seven games despite missing games in Japan due to Southern League Neck. He was on the disabled list from April 26 through 12 May, and returned as a significant part-time player, finishing the regular season with a .773 OPS on 199 at-bats in 69 games. Casey was suspended by the MLB for three games after his actions in the Coco Crisp–James Shields brawl. Casey announced his retirement on January 25, 2009, at the age of 34, having played 12 seasons of Major League Baseball. He currently serves as a baseball analyst for MLB Network. On July 3, 2009, he sat in for Red Sox color commentator Jerry Remy, calling the first game for his old team. On January 14, 2011, the Reds announced that Casey would do color commentary for 15 telecasts on Fox Sports Ohio during the 2011 season. On June 23, 2012, Casey was inducted into the Cincinnati Reds Hall of Fame and Museum. Hutch Award, 1999 given to the player who personifies the spirit, courage and integrity of former manager Fred Hutchinson. Inducted into the University of Richmond, Department of Athletics Hall of Fame in 2003. With Conan O'Brien, Casey is a founder of Labels Are For Jars, an innovative anti-hunger organization based in Lawrence, Massachusetts. In a May 16, 2007, Sports Illustrated Player's Poll, Casey won the distinction of being considered the "friendliest player in baseball", after winning 46% of the votes. 464 MLB players participated in the survey. Hal McCoy, a Cincinnati Reds beat writer for 35 years, has said, "There's no debate, and there never will be a debate. Sean Casey is the nicest guy in professional baseball. Ever." On August 26, 2008, Sean Casey was inducted into the Irish American Baseball Hall of Fame. On January 29, 2009, Casey was inducted into the Kinston Professional Baseball Hall of Fame. Casey was inducted to the Cincinnati Reds Baseball Hall of Fame (along with Dan Driessen and John Reilly) on June 23, 2012. ↑ Stringer, Matt (November 20, 2003). "Philadelphia: The cradle of baseball". The Temple News. Retrieved December 3, 2007. 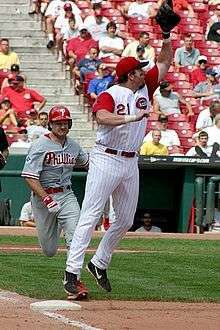 For example, Sean Casey, a lifetime .300 hitter, plays first base for the Cincinnati Reds and hails from Willingboro, NJ. ↑ "Biography". seancasey.co. Retrieved July 24, 2014. ↑ "Sean Casey". Sports Reference LLC. Retrieved July 24, 2014. ↑ "On-air personalities". Major League Baseball. Retrieved July 24, 2014. ↑ "University of Richmond Athletic Hall Of Fame". University of Richmond. Retrieved April 9, 2008. ↑ "Charlton's Baseball Chronology". www.baseballlibrary.com. Retrieved March 7, 2013. ↑ "SI Players Poll: Friendliest/Unfriendliest MLB Player?". Sports Illustrated. May 16, 2007. Retrieved April 9, 2008. ↑ "Grounding into Double Plays Records". Baseball Almanac. Retrieved April 9, 2008. ↑ "Casey expected to miss rest of ALCS". Retrieved April 11, 2008. ↑ Peek, Jeff (November 17, 2006). "Tigers re-sign 1B Casey". Retrieved April 11, 2008. ↑ Castrovince, Anthony (April 15, 2005). "Notes: Defense taking center stage". MLB.com. Retrieved April 9, 2008. ↑ Meyer, Paul (December 8, 2005). "Casey as good off the field as he is on it". Pittsburgh Post-Gazette. ↑ "Casey bids farewell to Tigers". Retrieved April 10, 2008. ↑ "Red Sox's Lowell leaves game with thumb injury". Sporting News. Retrieved April 14, 2008. ↑ Farley, Glen. "Three Sox, five Rays suspended for brawl". Retrieved June 7, 2008. ↑ "FOX Sports Ohio announces 2011 Reds broadcast team". ↑ "Past Recipients of the Hutch Award". Retrieved April 9, 2008. ↑ "Department Of Athletics Announces 2003 Hall Of Fame Class". University of Richmond. Retrieved April 9, 2008. ↑ Edes, Gordon (June 13, 2005). "Casey at the bat". The Boston Globe. Retrieved April 9, 2008. ↑ "SI Players Poll". CNN. May 16, 2007. Retrieved May 23, 2010. ↑ "Reds Hall of Fame Announces Class of 2012 \date=11/28/2011". Retrieved July 24, 2014. Wikimedia Commons has media related to Sean Casey.